Click Finished Second In Division III in batting average at .561. Gustavus softball player Rachael Click, a junior shortstop from Rochester, Minn. (Mayo HS), has been named to the College Sports Information Directors of America (CoSIDA)/ESPN The Magazine’s Academic All-America Team. Click, a First Team selection this year, was a Third Team selection last year as a sophomore. A three-time all-conference pick at shortstop, Click started all 38 games for the Gusties this past season. She finished first in the MIAC with 66 total bases, tied for first in hits (36), finished second in batting average (.563), slugging percentage (1.031) and third in on-base percentage (.600), runs scored (24) and RBI (27). Click knocked out team-highs in triples (3) and home runs (10). She set new single season records in slugging percentage (1.055), batting average (.560), RBI (50), and total bases (115). A First Team All-Region and honorable mention All-America selection, Click finished the season ranked in the top ten in four NCAA Division III statistical categories including second in batting average (.560), fifth in slugging percentage (1.055), seventh in on-base percentage (.591), and eighth in RBI per game (1.32). 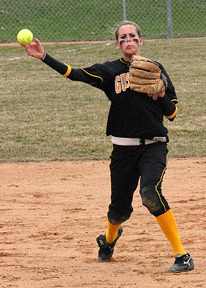 She helped the Gusties post a record of 30-8 overall and 18-4 in the Minnesota Intercollegiate Athletic Conference. Click becomes the 69th Gustavus student athlete to be named to a CoSIDA Academic All-America team and the third this academic year following men’s soccer player Trevor Brown and men’s basketball player Trevor Wittwer. Rachael is the fifth Gustavus softball player to be honored following Laurie Voit (1987, 1988), Barb Jaeger (1988), Mindy Mayerchak (1989), and Christina Diller (2003). Gustavus ranks 10th among all Division III institutions in number of CoSIDA Academic All-Americans (69). The CoSIDA/ESPN The Magazine Academic All-America® program honors male and female student-athletes annually who have succeeded at the highest level on the playing field and in the classroom. Individuals are selected through voting by CoSIDA, the College Sports Information Directors of America; a 2,000-member organization consisting of sports public relations professionals for colleges and universities in the United States and Canada. To be eligible, a student-athlete must be a varsity starter or key reserve, maintain a cumulative grade point average of 3.20 on a scale of 4.00, have reached sophomore athletic and academic standings at his/her current institution and be nominated by his/her sports information director. Since the program’s inception in 1952, CoSIDA has bestowed Academic All-America honors on more than 14,000 student-athletes in Divisions I, II, III and NAIA covering all NCAA championship sports.